A twisted mind fails to see the truth. It is a product of ego and stems into insecurity and cowardice. Since one can't deal with things squarely, one gets lost in its self-created labyrinth of complications. The clutter of thoughts owing to doubting, planning, conspiring etc makes the mind twisted and blurs the vision of the truth directly. Hence unconsciously, the mind becomes a machine that produces such thoughts continuously, which curtails clarity and robs one's natural peace. A twisted mind is further more a result of age long conditioning. The mind is conditioned for a long time to think and act in the complicated way. Used to such conditioning, the mind, involuntarily begins to function the same way at similar circumstances or almost at all circumstances. If not looked into, this mind can play havoc in each aspect of life. A pure mind is simply plain. It is endowed naturally and intuitively to know the truth because of continuous practise to keep it pure. Hence it is naturally conscious of things around. This is because of its ability to look at the truth the way it is, without any adulteration of self-woven thoughts. Hence it is a storehouse of peace. An advanced aspirant on the spiritual path, simply uses the mind as a tool to carry out the tasks before him and withdraws it into the Self. When in the Self, it is pure Consciousness, awake and alert. On the spiritual path, a pure mind is the basis for spiritual evolution. Ramana Maharshi says that the pure mind is not different from the ‘Self’, our true inherent nature, beyond thoughts. It is the state which every spiritual seeker aims for, which is actually inherent in us. 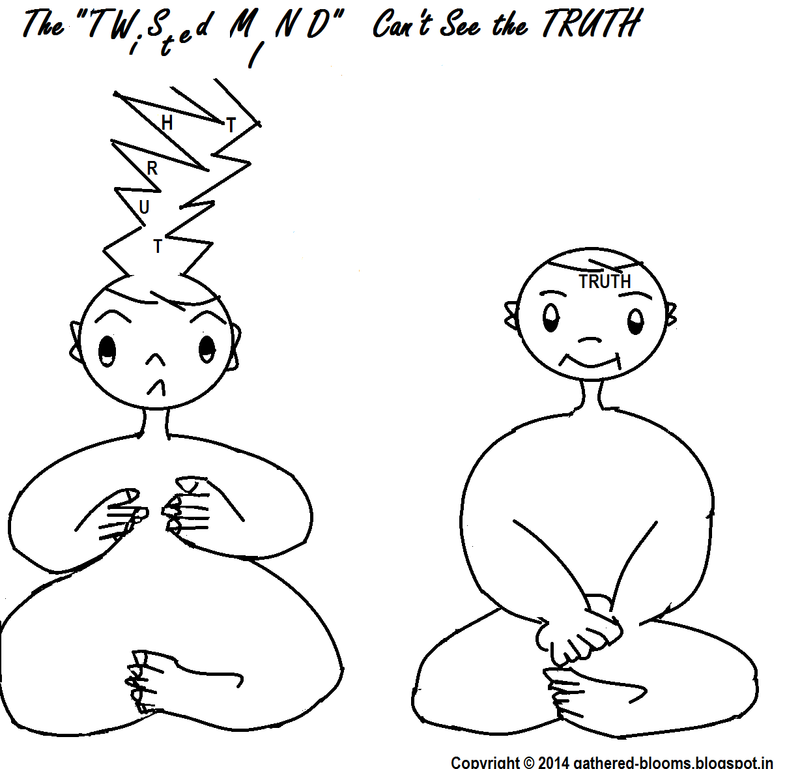 He further says that the mind introverted is the ‘Self’ and the ‘Self’ extroverted is the mind! The twisted mind can however be set right. The wish to straighten it is the very first step. Self-enquiry as advised by Ramana Maharshi guides one to one's own natural state of a pure mind. Even if we are not a spiritual aspirant, an uncomplicated mind will render a good night’s sleep, which is the desire of all. I related this story to my niece.... She exclaimed with understanding "Priya, ....Oh Ya!!!" I dedicate this article to all souls treading the spiritual path, and all who value a good night’s sleep.